Be smart and protect your hearing ! The R.G. Hardie Pipe Band Plugs look professional and are very comfortable to wear. Most importantly, they offer the protection you need ! The great highland bagpipe will easily produce 100+ decibels. If you listen to this for longer than seven minutes, you risk incurring significant damage to your hearing. 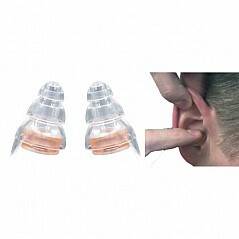 Therefore, hearing protection is an absolute necessity when playing the bagpipes or snare drum. We highly recommend he use of good hearing protection when playing in a pipe band or solo.